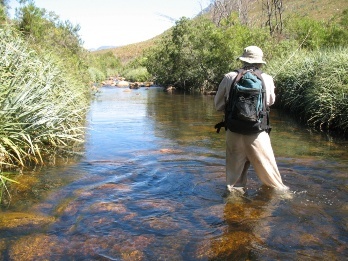 Ed Herbst writes: Tim Rolston, Cape Town’s foremost fly fishing guide, says that even the most selective of trout usually succumb to his ant pattern when all other flies have failed. I have, for years, fished a small weighted ant like a nymph using a strike indicator and Marcel Terblanche is taking this process forward after experimenting with this pattern on the Witels. Adding weight to a #18 or smaller curved hook usually turns it upside down and if you turn the fly around – i.e. by using the bead at the eye to imitate the big abdomen of the ant, you don’t occlude the hook gape as much as you would if you tied the pattern in the conventional way with the abdomen at the bend of the hook. The following articles provide some useful information on ants and their universal appeal to trout.